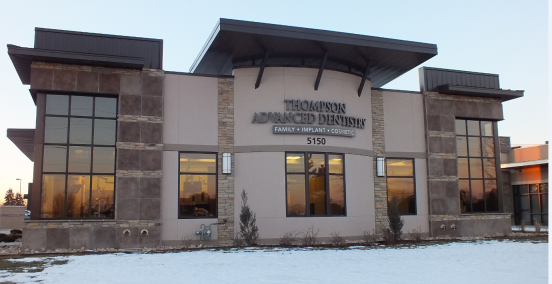 In a new beautifully designed, state-of-the-art facility, Thompson Advanced Dentistry is equipped with high-tech equipment and an outstanding team of dentists, hygienists, and staff to give patients the quality care they deserve. Dr. Joseph S. Thompson of Greeley, CO connects to his patients in a very trusting and friendly manner. Patients leave the office knowing that their Greeley dentist has listened to their concerns and stands behind his quality restorations and treatments. With an aim towards long-term optimized oral health, Dr. Thompson builds a communicative rapport, providing patients a safe dental environment. Dental fears and anxieties keep too many patients out of dental offices, but not in Greeley. Dr. Thompson and staff work to relieve dental fears through education, preventive measures, early detection, sedation dentistry and continued education. Patients repeatedly thank Dr. Thompson for caring for their oral health and comfort and will often refer his Greeley family dental office to friends and family. Patients looking for a dentist in Greeley appreciate the efficiency of our office staff. From online paperwork submission to Dr. Thompson’s detailed hour-long exam - complete with a health history review - new patients experience the convenience and care immediately. Patients are free to discuss their desires for an improved smile without the pressure to select high-priced procedures. Dr. Thompson works to educate each patient about the pros and cons of each available treatment for best informed decisions. Thompson Advanced Dentistry is a family dental office in Greeley treating patients of all ages, starting at age one. Dr. Joseph Thompson has dedicated himself to continued education programs and high-end equipment investments to give his Greeley patients the best care possible. Contact the office today and schedule an appointment. We look forward to improving the health and beauty of your smile.